The model 438USAI (Universal Switch Adjustable Interval Time Capsule) is an all Solid State In-Line timing device providing Interval timing control of any load device operating from 24 to 240V AC or DC. 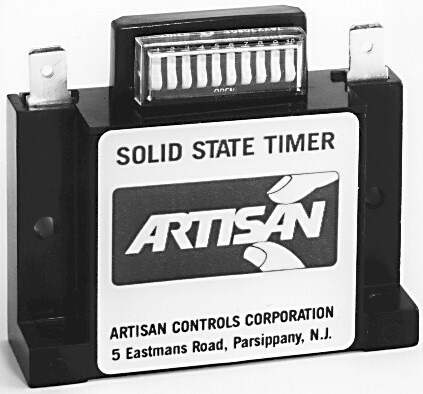 Timing is set via a binary coded dip switch and is adjustable from 1-1024 seconds. When power is applied, the 438USAI turns On permitting full load current to flow. At the end of the preset timing period the 438USAI turns Off and permits only leakage current to flow through the load. Output 10 milliamperes to 0.25 ampere inductive. Inrush to 8 amperes for 8 milliseconds. 10 volt maximum drop across timer when output is ON, 3 mA leakage current through timer when output is OFF. Timing Range 1-1024, 0.1-102.4 or 10-10, 240 Seconds. Timing Adjustment 10 position Dip switch located between power terminals.